Big. No really, these are big speakers. I'm not talking horn monsters but for many people these will seem enormous. Put them in most rooms and they will dominate - I really can't think of a bigger box on the market for the money. 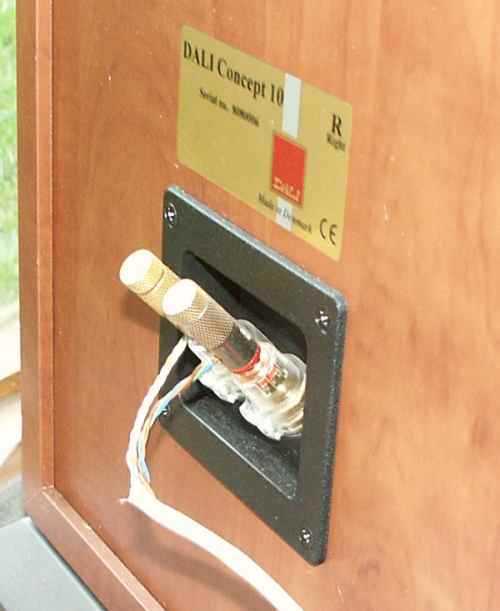 For most speakers the box is the single most expensive element in the total cost. Not only is it expensive in terms of materials, it will be more difficult to build, more expensive to ship and will take up more space in a dealers showroom. Big may be impressive but it isn't fashionable for those precise reasons. But as well as impressing the neighbours, big speakers have fundamental advantages over their smaller brethren. 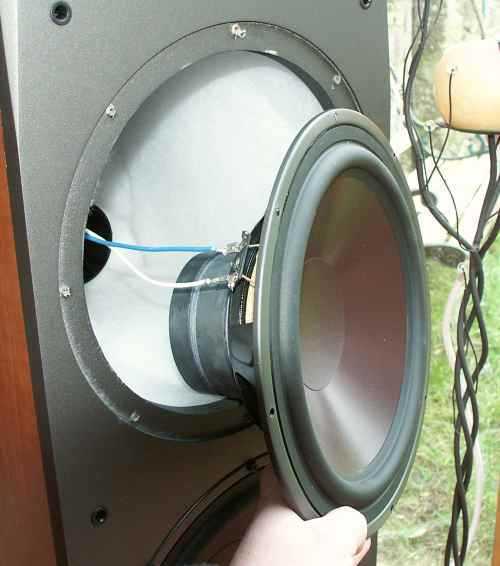 All things being equal a bigger speaker will have more efficiency (go louder for a given signal) and produce lower bass. But things arn't equal and the big box picks up one other important attribute - a big baffle means space for big drive units and the Concept 10 makes full use of this with two whopping 10" drivers in the bass section - this leads to even better bass extension and in theory better dynamics, those big cones just shift more air. If only it were that simple - because big boxes also carry disadvantages beyond those commercial ones already mentioned. The first is that those big flat areas of 'wood' are just asking to sing-along with the drivers, adding and blurring their output. The solution is to make the box walls thicker and stiffer and brace them well. In the 70's there was a rash of big, resonant floor standers and they were generally horrible, woolly boom-boxes made out of 15 mm chipboard. Here again the DALI looks good with a thick MDF box (20mm?) and a shelf brace separating the two bass chambers (each has a separate port - more on this later) - the 'tap' test produced a nice high note unlike the cardboard box effect of some. So... Here we have huge, heavy (35kgs), substantial boxes, four drivers a side, all for the price of a luxury miniature. So how's it done? First, despite the 'Made in Denmark' badge the drivers and box are all made to DALI's spec in China. That must make a hefty saving and in theory without effecting performance, providing the quality control is good enough. Beyond this the compromises (all speakers are a compromise) are more conventional. The two bass drivers and the mid-range driver all sport very nice looking, treated, pulp cones (remind me of Scanspeaks) but pulling them out reveals a pressed steel basket rather than the cast alloy one you'd expect in a smaller speaker of this price. Steel is OK but in theory it is less stiff and will throw a bigger 'shadow' behind the driver. Other cost saving measures include push-on tags for the driver connections and the use of screws rather than bolts to hold the drivers in. Those same drivers do look well made however and sport decent double magnets, so lets not get too pedantic about it. The soft dome tweeter looks pretty conventional too, though with a nice 'branded' face plate. I didn't pull the speaker to bits to check the crossover, but the binding posts are single wire only, this may be to save cash though many manufacturers, Naim and Cabasse to name just two, dislike bi-wiring. The last saving is in the finish, you have to get up close but the 'veneer' is plastic wrap, though this stuff is getting so good it'd fool most people most of the time. This is going to sound very glib, but just by looking at those tombstones at the end of the listening room you can guess what they are going to sound like. I know that auto-suggestion is going to play a big part which is why I do basic measurements, but whichever way you look at it these are always going to sound like big speakers. And so they should - what on earth is the point of putting up with, and paying for all the disadvantages of big speakers without reaping the benefits? Happily the Concept 10's deliver in spades. From the first moment the effortless dynamics of a heavyweight hit you between the eyes. For those of you, like me, that consider the ability to reproduce realistic dynamic swings in music to be fundamental, the DALI's won't disappoint. Those four 10" drivers obviously handle low to upper bass without breaking sweat, and because they are working within their limits the definition of low bass is very good as well. With my own Loth-x Horns (twice the volume of the DALI's!) I use a big Rel subwoofer to fill in below 60hz. With the 10's the Rel could still be tuned to help out the sub 30 hz output, but really was largely redundant. Now I know it's a taboo subject here, but it does mean that if your hi-fi doubles as a home cinema outfit with the 10's you'll find all the bangs and crashes you could wish for without shelling out for an active sub. This effortless bass performance is as important when playing Wagner as it is Nirvana, it gives scale, and scale doesn't come cheap. So assuming your room is OK then you are still going to be careful about placement. These speakers need at least 50 cms behind them, better still a metre, but this will be room dependent. 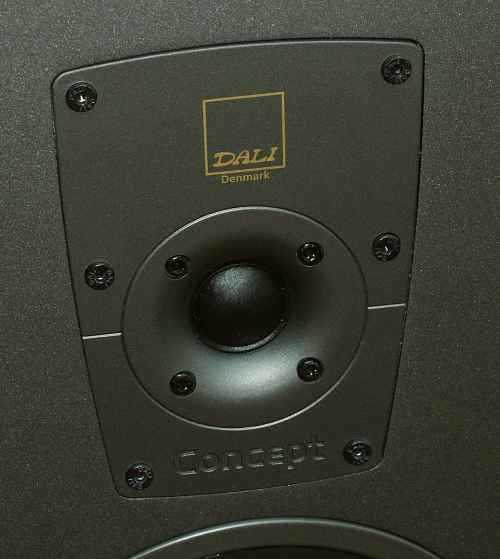 The DALI's do offer some scope for tuning as the two bass drivers each reside in their own ported box separated by the shelf brace. The lower one ports through the front the upper from the rear. Here you can damp bass output somewhat by adding wadding (tradition says a sock, but foam plugs etc). The result is different in each case but it costs nothing to try. Bass depth is matched by speed - there's no way that this much wood is going to stop and start like a small standmount, but then the small standmount isn't going to pushing out much under 50 hz. But the DALIs do a great job of making bass lines dance - a fan of Level 42 (me) would be pleased to hear the Concept 10's producing the depth and speed of that bassmeister, here of course the midrange driver and even tweeter are participating in the production of the 'slap' of the bass string. Just one more thing on the bass output (I know I've spent and inordinate amount of time on the subject, but it's their 'raison d'etre') - the speakers are recommended for amps over 50 watts. Given their claimed efficiency of 91 dbl this is a bit of a surprise as generally such efficiency would put them in the range of lower powered valve amps, maybe not 300b SE's, but certainly something like a 25 watt EL34. I did a brief trial with a 25 watt amp I had here and I have to thank DALI for their honesty. Here we're coming across one of the misconceptions regarding speakers, that efficiency is all that matters... The efficiency is only one parameter in how easy a speaker is to drive. The other is the impedance, and I suspect that the DALIs with their multi-driver line up, are a pretty tough load. Using said amp the bass quickly became poorly controlled and soon after the soundstage collapsed and went hard. Luckily meaty transistor amps are everywhere, but again load tolerance is more important than output. Here I'm pretty much valve only and the SQF 'Son of Pharoe' fitted very well as it is a 40 watt per channel amp, but load tolerant. That said I'd imagine the Korato pairing I tried a couple of years ago would make a perfect match, both in terms of quality and budget. Having exhausted my bass vocabulary we'd better "move on up" ("get on down" - James Brown... ehem.... sorry). Having a dedicated mid-range driver rather than one doubling with the bass, partly makes up for the problems of a big, relatively resonant box, that is compared to our 'generic' stand-mount. And the result is a pretty well integrated midrange. True you have to take all that I've written above into account, but that said, you have to remember that with the division of finances the DALI mid-range will be up against a very much more expensive driver in a two-way. It's the subtle stuff that loses out. The production of air around instruments, the breath of a Sax reed, you know all the cliche's, but there's no denying that the DALI designers placed other things as top priorities in their brief. What those designers did do though, is to make this weakness simply one of omission, or at least reduced capability, rather than a fault which irritates - all credit to them. The midrange was well integrated and helped pull the music along. All too often such designs end up as 'ting-and-boom' boxes which sound very impressive for a moment, then become wearing. The DALIs on the other hand have a remarkably even response, perhaps sometimes a little downtilted, but as positioning and partnering equipment is so critical to the overall bass performance this result is going to vary from situation to situation. The tweeter itself is one of the better of the breed, gone (thankfully) are the days of edgy metal domes, it doesn't draw attention to itself just gets on with it. Imaging was a pleasant surprise. Given a sympathetic room they managed a large powerful soundstage with even a little depth. In fact the good reproduction of the bottom octave is a major part of this, the biggest difference my Rel makes to the Loth-x horns is not bass extension but the feel of a hall. No, the Concept 10's are not going to pinpoint image like a 10 ltr bookshelf, but in managing to fill a room they came much closer to the live event than any amount of holographic imaging. True the Concepts are not going to be the first choice of people into chamber music and small scale jazz, but anyone who has heard an orchestra in full flight will appreciate how close the Concepts get for the price. So not a "me too" product. Not 'all things to all men', but a speaker that for some people will do things few others will do at the price - and for that reason alone it is worthy of serious consideration. Power amp: AudioNote Silver Quest, SQF 'Son of Pharao'.